This continues the story of the Battle of Shurima, which took place during the Hextech Revolution. It began when the ocean spirit Ceruleana appeared to King Jarvan III and warned him that a Void rift within Zaun’s pyrikhos mines would soon burst apart and destroy Runeterra. The King has ordered Demacia’s armies into battle to seize the mines and exorcise the Void-touched “dark sand” within. In Factions style, the outcome of this battle depended largely upon actual matches fought on the Fields of Justice. There is a space between dimensions, between worlds. Now it began to shift, and as it swelled in some places it drained from others, leaving points where the dimensions pressed together. There are patterns so strong that they echo through the multiverse. Now some of these patterns reverberated through the membrane between Runeterra’s home dimension and alien realities. There are many such patterns, and the strongest are not always the ones you might expect. Now, as it stood on the brink of apocalypse, these alien echoes began to reshape Runeterra. Dr. Yvania Tell glanced over the report. One new pyrikhos seam discovered. Four workers missing. One worker’s status updated from “active” to “ill; psych; thaumatox?” on the master personnel list. “Yes, they do happen, in our underground mines where indentured Noxian refugees toil day and night to mine an absurdly large supply of Void-touched … Void-touched … ” she fumbled for a word. “Sand. It’s sand,” Dr. Brekston said flatly. Dr. Brekston paused. She clicked the pen. The skull’s eyes flashed red. They shared a meaningful look. “Sick leave,” they agreed in tandem, then grabbed their facewraps and walked out into the sandstorm. Jinx leapt from Blitzcrank’s shoulders. As her boots struck sand, she whipped out Fishbones and put her finger on the trigger. Valor spread his wings and screeched an avian obscenity. 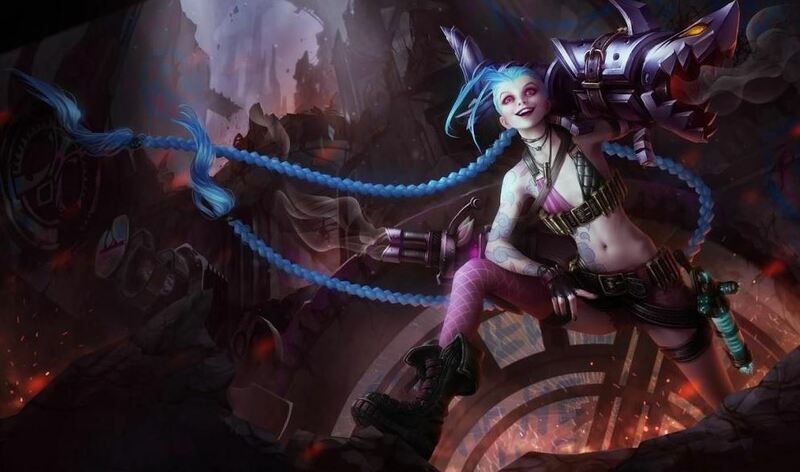 “Bored now!” chirped Jinx, and clicked the trigger down. Valor veered left. Quinn’s crossbow bolt intercepted the rocket and detonated it in midair, scattering smoking debris across the stretch of sand between them. She brought the sights back down and aimed right for Jinx’s heart. “HALT! THESE HOSTILITIES ARE ILLEGAL.” Blitzcrank stomped forward, using his enormous metal body to block both lines of fire. Jinx gave Blitz’s leg a kick. “Aw, c’mon! That chicken needs some roasting.” Her heart swelled — mostly with pride at her quip, though the copious amount of stimulants running through her system also played a role. She hopped onto Blitzcrank’s shoulders, pointed back toward the mines, and clapped the steam golem on the head. Adopting a caricature of Quinn’s voice, she gave her orders. 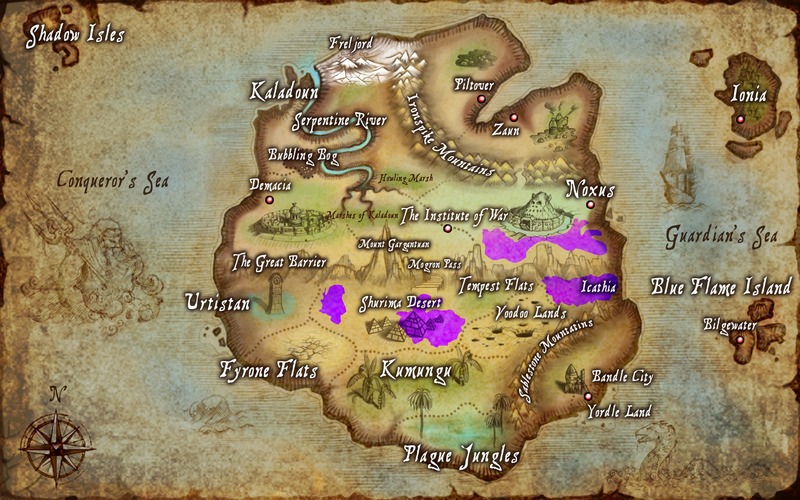 The spread of the Void’s contamination throughout Valoran. The message had been delivered, albeit to a perhaps unreliable messenger. 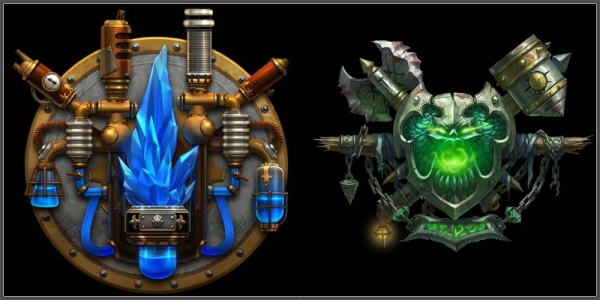 Demacia related Ceruleana’s prophecy, that unless the mines were destroyed at once all of Runeterra would be consumed by the Void. King Jarvan III demanded that Zaun surrender the mines immediately, or they would be seized by force. They were convinced that it was true, although they had no real evidence other than their say-so. They had little hope their demands would be met—the destruction of these mines would bankrupt several influential Zaunite megacorporations—but there was no time for negotiation and investigation, and the corporate mining authority’s first instinct would be to stall them with lawyers and bureaucracy. There was no time for such things. The Void was coming, and Demacia would cleanse the mines of its contagion before it could break through. The aftermath with the League was of distantly secondary importance to averting an apocalypse. As the sun set, Demacia’s army marched across the sands. In the distance, a warpgate portal flashed midnight purple for a split second before a hexplosive blast shut it down. The pyrikhos charges placed by Piltover’s secret agents had worked: no reinforcements would be coming from Zaun, at least not yet. But the fact that they had tried made it clear that they would not heed Demacia’s warning. When the battle was met, it was as nothing Valoran had ever seen. The HexKorps Third Armored Division’s battletanks lit up the night with scintillating purple and orange beams of volatile techmaturgic energy. Demacia’s mages projected arcane barriers to block them. Where they held, the air seethed with inhuman screams from beyond as the already-strained dimensional fabric stretched diaphanously thin. Where they failed, dozens fell dead, bodies trampled underfoot as the knights riding alongside them shouted orders to advance. Demacia’s soldiers watched in horror as girthsome war zeppelins soared over the horizon toward them, bearing rockets loaded full of Singed’s gaseous toxins. Another volley of death ray fire swept through their ranks. They held their shields against the storm and whispered fervent prayers for protection. The zeppelins were passing over the hextanks now. They’d be firing any moment. A voice came from the heavens, tinny and stern, speaking in a clipped Piltovian accent. A gleaming armada of silver airships appeared on the horizon, magnavox-enchanted loudspeakers blaring. There came a moment of silence. The voice spoke again. Red and white flashes illuminated the sand dunes to the east as Piltover’s Special Shuriman Expeditioneers opened fire on the flank of the HexKorps. The lead airship set the Zaunite zeppelin fleet ablaze with a single volley from its ultravelocity aircannons. A great cheer rose up from the Demacian ranks as Piltover seized the skies. 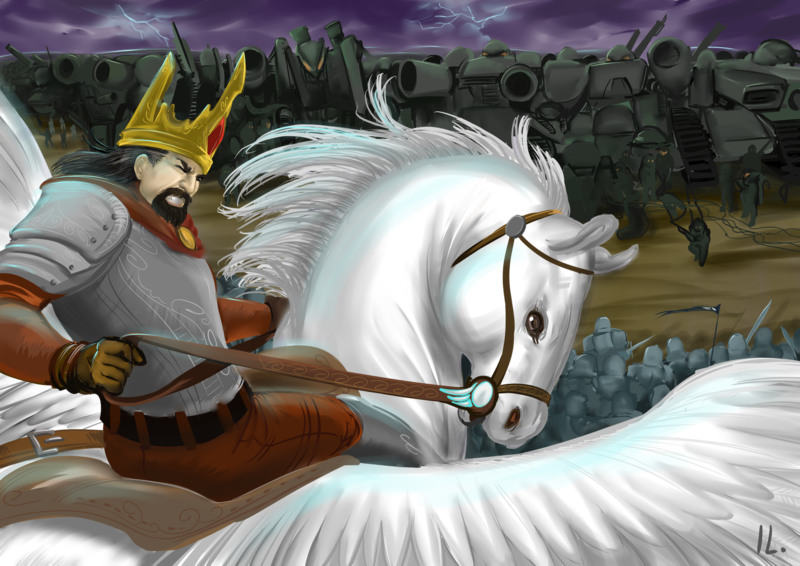 As the flaming hulks of Zaun’s war machines fell from the sky, Prince Jarvan IV ascended on his winged steed, forward of the Demacian ranks, beyond even the galloping Demacian cavalry, and looked down upon the Zaunite formation from the heavens. The desert night air was cold, thin, poisoned with the sick-sweet tang of the Void. He stood in the stirrups and raised the Demacian battle standard with both hands as the alien wind whipped the banner’s ensorceled silk. The golden threads shone with the hopes and prayers of a hundred thousand soldiers of Demacia marching into death that they might set the world right. Where he cast this standard, they would fight, and for some it would be their last battle. He was the lone vanguard, the crown prince, the exemplar of Demacia, he held their faith and trust in his hands. He knew the time had come, and jumped. His focus never wavered, even as explosive gunfire and techmaturgic energy beams glanced off his gleaming golden armor. He fell, and the standard shone in the refracted light of the Zaunite ordnance. In the instant before he touched earth once more, he slammed the standard into the sand at the center of the HexKorps formation with a mighty heave. The cataclysm cast up great walls of stone, and the earth’s roaring ascent punched Viktor’s hextanks into the sky. They flipped and spun like the dainty playing pieces of an overturned game-board. Jarvan pivoted to thrust his lance through the fiend’s chest. The purple lightning around his hands guttered and died as torn arteries and Pharmakon push-tubes gushed red and purple into the sand. The troopers fired. Jarvan gritted his teeth as the gunfire sang against his enchanted armor. His eyes sought a worthy foe. He saw a HexKorps Kommissar shouting orders and silenced him with a lethal strike. The machine-men began to regain their bearings. Scrambling to the tops of their tanks, they aligned their rifles and opened fire. He struck three of the vermin from their nest atop a tank, but still the shots came faster and faster. His armor, forged to withstand dragonfire, grew hot. He heard an immense hollow thunk followed instantaneously by a deafeaning explosion; a bursting tank shell knocked him to one knee. He lifted his head in defiance, and saw the majestic banner of Demacia waving proudly in the wind. The bursts of gunfire slowed in tempo, then subsided entirely. Jarvan saw the HexKorps troopers looking up over his head. A roar shook the ground; not a machine’s roar but that of a great beast. Shyvana dove into the valley and landed at Jarvan’s side. As she enveloped him in her wings, he heard her fiery breath incinerating tank and trooper alike. Knights flying the banner of House Lightshield galloped down the slope, followed only shortly thereafter by men-at-arms charging to join their Champions in battle. Piltovian riflemen lay prone around the rim of the dunes and sniped HexKorps troopers from their high vantage point. “Fall back! FALL BACK!” shouted the HexKorps commander. He switched his tank to maximum speed and rushed toward the sand wall cast up by Jarvan’s aerial strike. Though it seemed utterly impassable, the pyrikhos-fueled tank smashed right through the raised terrain. The remnants of the Third Division hastened to follow. Jarvan barely heard her, fixated as he was on the breach in the wall. “They just went right through.” They always just go right through. Her voice drew him back. “Will we pursue?” she asked. Demacia charged toward the mines, and found their path blocked by five mechanical golems, each sixty feet high. Nerve gas rockets struck deep into the ranks of the men-at-arms of Houses Spiritmight and Vayne. Thousands of soldiers fell gasping to the sand as clerics struggled to save them. Yordle pilots in their Reconaissance Operations Front-Line copters flew in and spattered the robots with gunfire, to little effect. A copter swerved low and fired a harpoon into the walker’s knee joint. An instant later, the robot yanked the cord out and used it to swing the copter down into the sand. It exploded in a glittering burst of phosphorus. The failed attempt gave Lux a bright idea — she swung her staff and bound the walker’s legs with a luminescent snare. She tightened the bond, and the immense war machine came crashing down to the sand. Men-at-arms swarmed the fallen giant and forced their weapons through the gaps in its plating. The damaged robot broke the light binding and rose, staggering back as thick purple smoke poured from its joints. Its death ray sputtered sparks. The yordles came around for another pass. Synchronizing their fire with a massive volley of scale-splitter arrows from enchanted Demacian longbows and a final burst from the Piltovian airships’ main guns, they pierced another mech’s plating and put it out of commission. The others fell back toward the warpgate. The airship’s loudspeakers came on again as the immense craft hovered overhead. Ropes dropped from the airships’ hulls. Medics slid down and hastened to the stricken knights and men-at-arms, somewhat to the astonishment of the Demacians showing no particular priority for the health of the former or the latter. They opened up strange kits packed with crystals and herbs, prototype medication developed in the treatment of Noxian refugees sickened by Void contamination. Summoner Flan, an expert in the healing arts and an inductee to the Riotous Fists Clan, joined them in driving the lethal sickness out. Once the medical personnel were on the ground, Champions and Summoners joined them, and the airships departed to reload and pick up more troops. Ezreal landed beside Lux, who was drawing a map in the sand for the Summoners and mages beside her. She looked to him. Then at the map, then back up to him. There was a few moments’ pause. She looked to Ezreal again. They stepped forward toward the mines, and a brilliant purple flash of light blocked their path. Malzahar clenched his fist. Tendrils of Void energy snaked out of the ground and wrapped themselves around Ezreal’s legs. He swept his other hand to the side, and an extradimensional ribbon of purple light wove through the Champions, sapping their magic. A tide of Voidlings skittered forth from the mine entrance to devour them. Only Lux appeared immune. She stood outlined in golden light as Kayle hovered behind her, sword drawn. Kayle’s sword burst into flame. “You will burn here, fiend.” She swung her sword down, and a blaze engulfed Malzahar. His howl of pain brought an extradimensional gale that extinguished the fire in the Void’s vacuum, but not before Lux had seized upon the distraction. With the white crystal held in both palms, she poured her strength into an attack without reserve. Malzahar saw the prismatic radiance explode from her palms and vanished before the beam struck. The Voidlings evaporated into wisps of foul purple smoke, as did the tendrils holding Ezreal. He fell to the ground, panting. The Voidlings were destroyed. But they heard the skittering of hundreds, thousands more within the mines. They moved aside as the men-at-arms of House Buvelle advanced and set their shields to repel the charge. She glanced aside as Garen and Galio moved to the fore of the men-at-arms holding the mine entrance. She saw the banner of House Buvelle fluttering in the air, and wondered if any scrap of it would be left by battle’s end. She heard Sona strum her etwahl from the back ranks. Her mage’s eyes saw the currents of invigorating magic that followed the notes as they moved through the air. Swain addressed his troops as the HexKorps divisions moved through the warpgate to Shurima. Shouts of BLOOD FOR NOXUS and STRENGTH ABOVE ALL filled the room. Swain looked over his troops. After a few moments, he raised his hand. The chanting stopped. 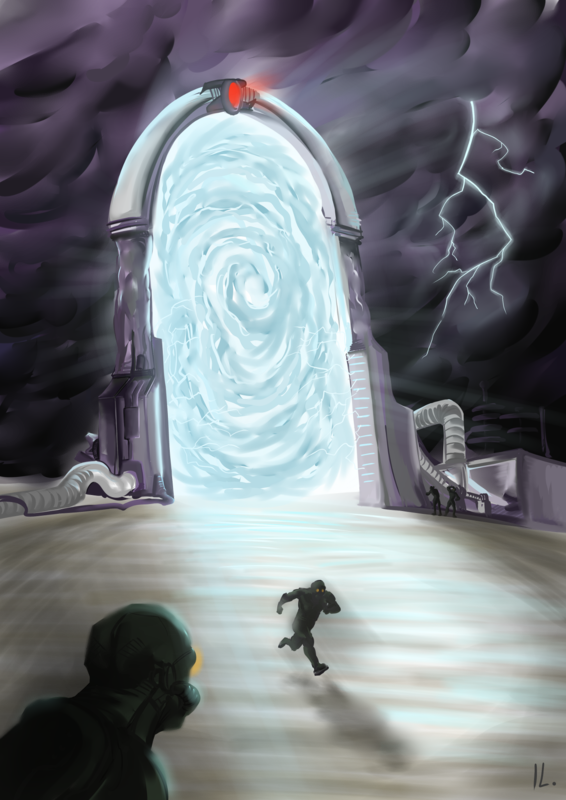 Without pause, he turned and walked toward the ramp leading to the portal. His cane struck the floor with his first step, but already was drowned out by a tide of marching footfall hastening to follow. Viktor slammed his fist down on the firing control. A beam of light struck the knight, whose armor glowed white hot as she screamed and fell from her horse. He laughed through the mega-vox amplifier as her troops watched her burn alive. He gave the command to fire. A volley of techmaturgic weaponry ripped through the Demacian ranks. Blue and white flashes of light illuminated the desert as their magical barriers broke apart. As his calculations had predicted, and as his experiments had confirmed, their simple magic was powerless against the Void. It drew its strength from Runeterra’s arcane foundations, but those foundations were being churned apart by the Void energy in the sands beneath. The rules had changed. They could not adapt. They would be consumed. He knew from his careful studies that Demacian magic drew power from faith and conviction. As their fighting resolve crumbled, so too did their magic. And without their magic, not merely the incantations and spellwork of their mages but the ambient magic that lent strength to their blows and protected their fragile meatsack bodies, they were merely savages with pointed sticks. The HexKorps fired its second volley and veered off toward a flanking position at maximum speed, revealing the Noxian legions marching behind the tanks. They charged forward into the broken Demacian lines. From what Viktor could see, it was a slaughter in the making. For now, his sights were set on those irksome mages surrounding the mines working their primitive spells. He caught sight of Jayce just before a shock blast knocked him from his tank and sent him rolling across the sand. He struck his chest to restart his primary actuators and came up to a kneeling position. Jayce was already standing over him, hammer raised, mammal jaw set with a look of simple chemical anger. Viktor patiently measured the milliseconds as Jayce began his swing. At the moment of greatest structural weakness, he struck his shoulder with the end of his scepter and sent a massive shock through the human’s armor. Jayce stumbled back. Viktor rose to his feet and twisted the end of his staff. He measured his position at approximately 43 meters from the boundary of the mines, with an angle of 57 degrees between himself and Jayce relative to the region’s principal leyline … he pressed a copper activation panel and slid his thumb down in an arcing motion. He heard a click as the resonance lock engaged. A gravimetric distortion matrix formed below Jayce and pulled him down to the sand. Viktor saw his nemesis struggling to stand up. He charged his death ray and took aim. As he fired, a flash of white light blinded him. He reset his optical filters and saw Lux channeling a protective sphere of light around Jayce. Before he could fix his aim, a burst of light knocked him back. “I’LL GET YOU NEXT TIME, GADGETEER!” He shook his fist at Jayce, then ducked another shock blast and boarded a hextank circling around to retrieve him. Ezreal looked out at the battlefield. This was not going well. The HexKorps was tearing through Demacia’s forces. He didn’t recognize most of the banners, other than those of House Crownguard, which he knew from the seal stamped onto the smooth parchment envelopes that contained Lux’s letters. Those guys were holding the eastern boundary of the mine. He could just barely make out the sight of Garen and Darius hacking at each other alongside their troops. A little more interesting out here than on the Fields, but still a pretty boring fight. Two big beefy dudes in plate armor that weighed more than he did smashing at each other with ridiculously large pieces of metal. Not far from them, Summoner Nhan and Summoner Naggarok were throwing spells at each other. Kind of interesting seeing two Summoners fight directly like that. Still, eh, they both seemed pretty good at knocking the kill-hexes aside. Another symbol he did know was the crest of House Lightshield. It was pretty hard not to, seeing as it had been on pretty much everything in Demacia when he’d visited. That was King Jarvan’s own House, Lux had explained to him in those slightly weird reverent tones she’d adopt when talking about all that fancy royal stuff. Sometimes he thought she’d been put through hypnosis sessions as a child or something, but if so, then so had pretty much everyone from Demacia. He knew that it had been a very bad sign when the knights carrying the banner of House Lightshield were blown to pieces by HexKorps artillery, and when those Noxian axe maniacs had fallen on the survivors and started lopping heads off. It didn’t seem like a whole lot of them got away. Noxians. He really hated those guys. Anyway, what this all meant was that he was running out of time. Right. Gotta focus up. Lux turned to look his direction. Beside her, the men-at-arms of House Crownguard readied themselves to repel an assault by HexKorps shock troopers. Longbowmen behind the men-at-arms shot a hail of arrows into the charging troopers, but most of the hextech-augmented crazies just broke them off and kept running. Lux glanced over her shoulder as the charge continued. Hextanks up high on the dunes opened fire on the Crownguard men-at-arms. Their enchanted shields deflected the beams down into the sand. The charging troopers fired their bolters, and they seemed to do more damage—several men-at-arms went down as the explosive bolts detonated inside them with a really nasty popping sound. Ezreal had heard of sickos stuffing fireworks into dogs and cats and setting them off; he figured it probably sounded like that. He made a note not to get shot by one of those guns. Lux came running toward him to check out the sigils. She was usually all smiles, even in the most dire situations. “I never think about losing!” Now, though, she was looking pretty upset. While he waited for her to get to him, he caught a glimpse of a HexKorps heavy weapons team setting up a tripod-mounted death ray just behind a dune off to the side. The barrel hummed as Void energy surged up from the sands and hypercharged the deadly weapon. Maybe aiming for the Crownguard men-at-arms, he thought. This was getting pretty bad. He was no military expert, but it seemed like the troopers weren’t going to last much longer at this rate. They’d better work fast on these sigils. He saw the gunner turn the weapon toward Lux. Reality ground to a halt, and then the wheels started turning one awful click at a time. He saw the instant of recognition in her eyes as she felt the thaumic surge. He watched her spin in place and raise her scepter to conjure a sphere of light. It had barely started to form when the gunner fired. Her prismatic barrier shattered into glittering dust as the blast struck through and split the mail covering her side. She staggered, eyes wide with horror, and collapsed to the ground. He thought he had seen her fighting to gasp out a word in the last shuddering instant before she fell: Demacia. The men-at-arms marching under the banner of House Crownguard rushed forward to defend their fallen Champion—or at least her body. Her body. Lux was a body now. And that still wasn’t enough for them. The HexKorps crashed into the Demacian formation with a sound like meathooks in a busy slaughterhouse. One cold thought went through his mind. They want her head on a pike. They want a trophy. A convulsion of rage twisted his stomach. These repulsive machine-men were digging through the Demacian soldiers, rooting around in the carnage and corpses for whatever was left of Lux, so they could hack her body into pieces and parade it around, laughing and jeering, slapping each other on the back for killing a Champion. The moment snared him, bound him across iron girders of reality, and the tension lasted only an instant before his mind broke. He spun to see the same weapons team taking aim for him. He fired into the gun’s barrel; the explosion blasted the dune into a shower of sand and dark bloody mist. The dimensional fabric tore away from where it had stood. He heard demons screeching through the rift, the colors and sound piercing the air to slide slimy-bright around the spheres of his eyes. Their voices joined the building insanity inside his mind. The whole world was falling away, but he would maim and kill until the last moment. He was so sick that he almost was not. A squad of shock troopers surged over the dunes. They wanted him, too; they wanted to kill another Champion today. Ezreal’s fractured mind bled delirious euphoria, pushing his face into a lunatic grin as he met their charge with an essence flux field that drove clean through the line. Their hextech implants overloaded with thaumic charge and exploded inside their bodies; he heard them scream, watched them fall, watched their half-machine guts tumble into the sand. He sensed another threat, and greedily his eyes snapped to see what had come for him to destroy. A Kommissar of the HexKorps, raising his bolt pistol. He stared down the barrel and laughed. His arcane senses, flowing faster than they ever had before, followed his line of sight until he felt the sharp iron aura of the weapon’s hextech field collimator. He raised the smoking, burning gauntlet wrapped around his arm and bound himself to the metallic aura of the gun’s firing mechanism. When the Kommissar pulled the trigger, the bond snapped together, blinking Ezreal to his enemy’s side and out of the path of the explosive round. He saw the Kommissar’s side, his bare neck, his weakness and cruelty exposed to be destroyed. The gleeful rush of power left him as he saw Lux’s eyes in his memory, through the haze of the shattering barrier of rainbow light, watched her die and fall to the sand. She thought she’d failed. Adrenaline crashed through Ezreal’s magically attuned blood. His overheating gauntlet sucked rough, raw magic from the air and into him, and the rising arcanochemical fury gave his slight form the strength of a hulking brute. He grabbed hold of the Kommissar, this nobody who had killed the Champion he loved and might have loved him. He howled wordless hate as he slammed the man’s head back into the sharp angled metal of his tank, again and again. He dropped the twitching body into the sand; broken hextech pumps inside the Zaunite’s wheezing chest forced his lifeblood out as he died. Ezreal leapt atop the tank and blasted the hatch open. He shot it full of arcane death before he even saw who or what was inside. He smelled burning flesh and hot metal, saw nothing but smoke. This wasn’t a game. This wasn’t a League match. There were no stands of cheering fans. There was no scoreboard. This was the first time he’d tasted killing, and he knew it was driving him insane. More. He needed more. There was no other direction for him to go. The distorted metallic boom of Viktor’s laughter resonated across the battlefield. Ezreal turned to see him approaching on another hextank. A black metal golem shaped like Blitzcrank clattered forward. It raised its three metal arms; an enormous gripping fist exploded from each, trailing steel cable. Ezreal dove beneath the oncoming metal hands, tumbled into a roll, and rose with a mystic shot that blew the robot’s metal chest apart. It fell. Ezreal jumped on top of the wreckage and fired another shot into its head. He crouched to rip out its pyrikhos crystal power core. His gauntlet conducted the machine’s fading arcane signature into him. The drained core fell from his fingers as the thaumic imprint of the golem’s construction filled him with alien power. Somehow, he knew at once what it was, what it could do. Another doom bot raised its arms. Ezreal braced his gauntlet with his right hand and projected the imprint outward. The shape of a fist outlined in radiant magical energy rocketed out from his gauntlet and ripped the doom bot’s head from its shoulders. The machine staggered, spun, and fell. Ezreal shifted through arcane space, coming out of the blink high above the battlefield, looking down on the endless legions of Noxian soldiers and the mechanical monstrosities Zaun’s factories had churned out. He looked down at them from the heights of the cloudless night sky. He looked down in judgment. Up here, above the hex-cursed sands, the magical energy was so strong, so clean, so pure. Pure like his hate, pure like his power. He pulled it all into him as he fell. A radiant vortex whirled around him, brighter and brighter. He shouted to Viktor as the arcane vortex blazed sun-bright. And with one trueshot barrage, he did. The tidal wave of energy crashed through a swath of the clanking hextech army. Its undertow wrenched joined metal and flesh apart. But the angle was too steep, and it only traveled a short distance before crashing into the sand. The pyrikhos began to burn. With the rage and strength drained out of him, two sober thoughts trickled into Ezreal’s mind as he fell. I think I got shot. The ground approached faster and faster. He looked down at himself and saw torn, burned flesh where explosions and death rays had struck him. Half-lucid, he wondered how many of his organs were intact, and tried to remember from all those science classes he’d daydreamed through which ones were really important to have. With only a few seconds to go before he hit the sand, someone caught him. The impact was agony, even through the haze. He heard a strange sound as his vision and mind spun off into blackness. Vi’s voice. But … kind? No, more like … understanding. Black. Edged with voices. Yellow eyes. Demon voices. Black. The broken remnants of the Demacian army fled from the mines. The Nightmare Cavalry rode down the slowest stragglers and came back to throw their heads into a pile. Swain glanced over the heaps of corpses. They’d eliminated a few good Demacian officers. “Demacia just got a little dumber,” he muttered to himself. Not a bad take. Swain looked down the list. He paused when a familiar sound, a sort of shrill warble, rippled through the aether. Malzahar appeared above the entrance of the mine. He swept out his arms as the stars went out. Blinking yellow eyes, thousands of them, began to pierce the spread of midnight purple. He started laughing. Malzahar looked down upon them. His laughter echoed on in the indistinct gibbers that radiated down from the sky. The warpgate portal burst open. Voidlings and beasts more alien still flooded out, rushing toward them. Darius hefted his axe. 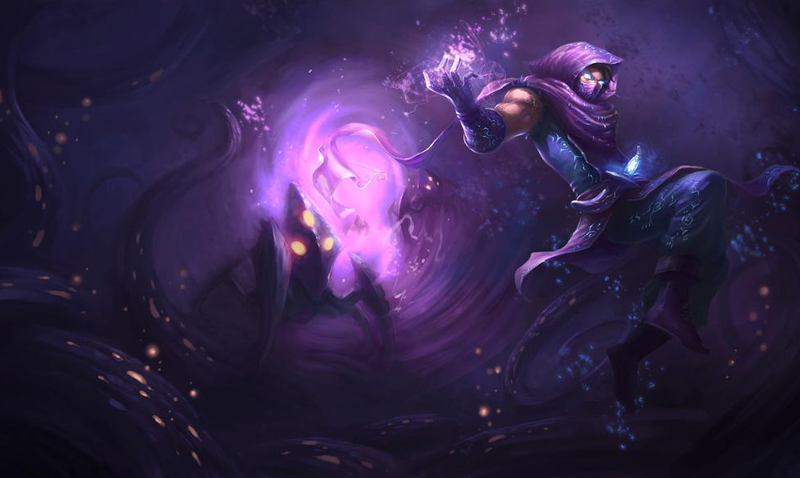 He stepped forward to split Malzahar in half when a portal opened between them. Cho’gath stomped, Kog’maw pranced, Kha’zix buzzed, and Vel’koz hovered forth, chittering and growling. LeBlanc raised her staff and struck Cho’gath with a searing flash of light. Cho’gath’s claws seized LeBlanc and fed her into his maw. She disintegrated into twinkling motes as the real LeBlanc peered out from behind Darius. As the battle began, Swain spared a glance to the side to see Demacia’s army regrouping and charging back toward the mines. Coming to help. Only a few units left in fighting condition. Still worth an ‘I told you so’ from Jarvan. His orders given, and his strategem set in motion, Swain proceeded to morph into a giant bird. After that, as was usually the case, his recollection became a bit hazy. The final phase of the Battle of Shurima has begun. We held some special matches to help decide how this will play out. We’ll finish this with some more dice rolls and randomness soon. Ha, thanks! I decided that I would see if I could write that scene using pretty much only Protomen lyrics, as a sort of constrained writing exercise. I mentioned it to a friend, who said that if I was going to do that, then Ezreal also had to steal his enemy’s power with his Mega Buster. I figure it’ll be a while before the multiverse collides again within the Factions storyline, so I seized my chance. Man, Swain is a freaking boss. Ezreal discovered he is prone to psychotic breakdowns. Viktor demonstrated his ingenuity and might. A good day was had by all it seems! I felt there was a distinct of lines for Darius. He said nothing this entire update! Almost a shame Piltover doesn’t have their Traitorous Noxian Division yet. Might have added a little bit more fire to the battlefield. There were so many Champions involved in the battle that I ad a real problem giving them screen time. My current plan is to slip in little teaser references (like the mention of Garen and Darius fighting) and then invite people to do BtB pieces that we can link. Storm — not really. At some point, possibly after this arc ends, I’ll give this a proper revision in consultation with the lore team. I’ll let you know then.